If your baby was born early, you have 2 important days to mark on the calendar: the day your baby was born and your estimated due date. When you measure your baby's development—that is, when you look at what is "normal" for your baby's age—consider both of those dates. By looking at the difference between them, you can adjust your baby's calendar age to account for prematurity and calculate his or her corrected age. During the first 2 years, using your baby's corrected age will give you a better idea when he or she should reach common developmental goals. Calculating corrected age isn't difficult. To determine the number of weeks' preterm your baby was at birth, subtract gestational age at birth from 40. 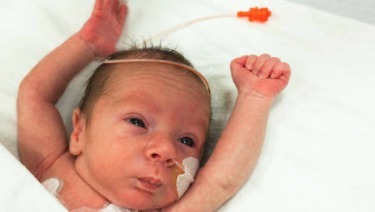 If your baby was born at 32 weeks' gestation, she was 8 weeks (2 months) preterm. If she is now 4 months old (16 weeks since birth), her corrected age is 2 months. In this case, even if your baby is 4 months old, you should expect her to have the developmental skills of a 2-month-old term baby. It would be unrealistic to expect your baby to be ready to roll from her stomach to her back—a skill that often develops in term babies around the age of 4 months. Your baby may just be beginning to hold her head up and smile, which is developmentally normal for a term baby of 2 months and, therefore, for a preterm baby whose corrected age is 2 months. Parents are often frustrated by well-meaning family and friends who express concerns about their baby's development. People may think your baby is delayed for a 4-month-old, for example, when, in fact, she is on target for a baby with a corrected age of 2 months.